É a estação mais chata do ano! Não gosto! Sair do trabalho, já noite, é horrível! 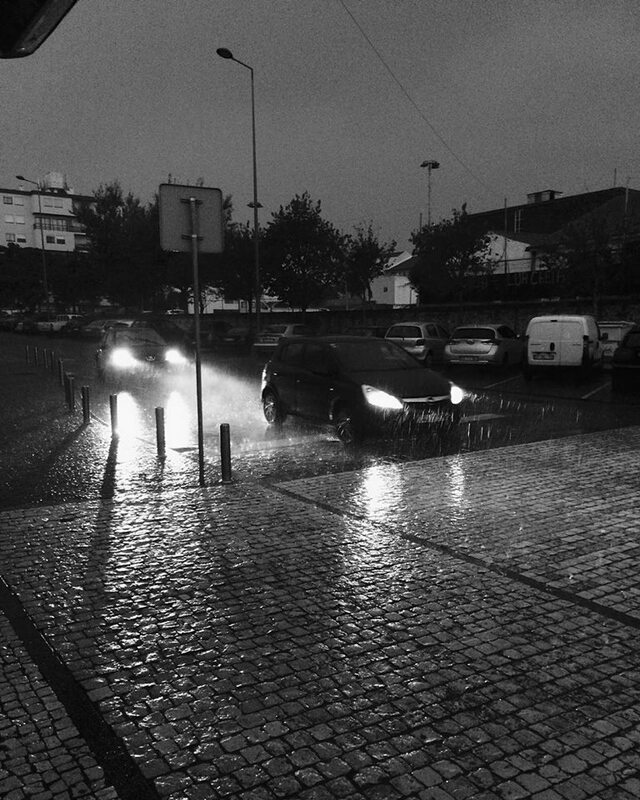 Há dois dias atrás foi assim… o céu estava escuro, estava prevista muita chuva… e, na minha hora de sair, até estava tolerável… mas isto só durou uns segundos! Tive que me abrigar num toldo que, felizmente, existia pelo caminho… para evitar chegar ao carro como um pintainho! ahah! Captei então algumas fotografias e esta, a primeira, foi a que gostei mais!!! Fotografia captada com o meu iPhone 5S (velhinho). Quando iniciei novamente a corrida até ao carro, nova carga de água! Estava destinado que tinha de chegar a casa bem molhado! It’s the worst/boring season of the year! I don’t like it! Get out of work, night, it’s horrible! Two days ago it was like that… the sky was dark, the prediction said that it was going to rain a lot… and, when I was on the street going to my car, it was tolerable… but it lasted a few seconds! I had to stop below a sunblind that exists on the way… to avoid arriving at home like a peeper! ahaha! I took some photos and, this one, the first, was the favorite shot!!! Photo with my old iPhone 5S. When I started running to my car, another heavy rain fall… so, it was my destiny, I had to arrive at home wet! Pela foto consegui captar o momento da forma como descreveu. Perfeito!